Ghostbusting in the Blogosphere: Is Ghostblogging Unethical & What’s the Best Way to Deal With It? Six years later, the blogosphere thrives (though still not the same without David’s wisdom), and ghost blogging remains a perennial topic of conversation. David revisited the ghost blogging issue in 2006 as did several other bloggers in 2007. And this past month, Mark Bennett raised the issue anew at Social Media Tyro, followed by Scott Greenfield at Simple Justice. Both Mark and Scott condemn ghost blogging and link to a Jenni Buchanan’s Legal Ghostblogging site which listed the lawyers who’d used her services. And now, Scott’s and Mark’s decision to call out the lawyers who use ghost bloggers itself has been questioned by DC criminal lawyer Jamison Koehler as well as in more comments at Social Media Tyro. So what to make of all of this? Here are my thoughts. First off, on the issue of e-shaming or call outs foremost, that’s the First Amendment at work. (though I agree with much of Jamie’s post, I wouldn’t characterize Mark’s or Scott’s critiques as cyberbullying). Sometimes the First Amendment means that you (or me for that matter) get a little roughed up. That’s the nature of discourse. Having said that, I don’t criticize Mark or Scott for outing the ghostblogging lawyers, since Buchanan’s clients willingly provided testimonials and in doing so, put themselves out there. Nor do I take issue with Brian Tannebaum’s decision to disclose lawyer marketers with tainted ethics records (in fact I interviewed him about it here) because frankly, that information is public record (even Avvo lists ethics violations). Nevertheless, I’m far less comfortable with criticisms like this one about the lawyers embroiled in the Total Attorneys ethics mess or “naming names” of lawyers who advertise on what Eric Turkewitz has termed dreck blogs. As I commented on both blogs, the lawyers who subscribed to services offered by Findlaw and Total Attorneys, both of which are ABA sponsors, most likely believed that the ABA had vetted these companies’ practices before accepting their sponsorship dollars. Though an ABA or bar stamp of approval doesn’t give lawyers a pass, at a time where bars are providing little guidance and ethics related to social media are in a state of flux, I think that the more appropriate response in this category of cases is a behind the scenes education or a generally educational post rather than a public tarring. (moreover, the ABA and bar associations deserve criticism – and I’ve got a post coming on this as I promised in these comments). (Actually, the ethics Q is the toughest, so it gets a bit of discussion. In my view, ghost blogging is different from speech writing or “ad copy” since politicians don’t owe the public the same ethical duty that we lawyers owe to clients. And it’s different from outsourcing a brief where the supervising lawyer generally has some input and often lists a contract lawyer or associate. Also, bear in mind that some courts prohibit undisclosed ghostwriting of court pleadings for pro se litigants, finding that concealing the participation of a lawyer behind the scenes gives pro se’s an unfair advantage. Finally, writing web copy, bios and such (discussed in these comments) is also different from my perspective. Though I think lawyers should do it themselves, that kind of writing is descriptive rather than opinion oriented, so I have less of problem with it. To me, true blogging is personal so I apply the telephone test. I might have my assistant take a call for me, but I’d never ask her to pretend to be me on the phone. And if I did, that would be unethical.) Same with Facebook, Twitter and other media where the public expects that it’s ME communicating. 4. Ghost blogging is potentially a threat to the public since ghostbloggers are not lawyers and may provide mis-information to prospective clients. 1. Realize that there are plenty of ways to get the word out about your practice. You’ve got to choose the ones that make the most sense for you. Some lawyers love to go to bar events and participate on committees, some lawyers love to write, so they blog. If you don’t like to write, then don’t blog. There’s no shame in that. 2. If you like the idea of providing educational resources to clients, you can still do so through a blog. Just do it honestly. As I’ve suggested before, you can hire a law student to research and write blog posts under your supervision (as commenters to the post pointed out, supervision is very important since new attorneys may leave out information) and then give them a byline. In fact, in a down economy, paying new grads to write posts for you can help them earn a little cash as they look for work. In this way, you’re providing a valuable service and further, showing clients that education is important enough that you’re willing to pay to provide it. David Giacalone was spot on when he predicted that mcblogging might cheapen the quality of debate in the blogosphere. After all, most of those blogs are not necessarily anything to write home about. But even with ghost blogging, the blogosphere still thrives. As this very debate over ghost blogging shows, so long as enough lawyers blog authentically, vigorously, intelligently and passionately, the blogosphere will rock on. 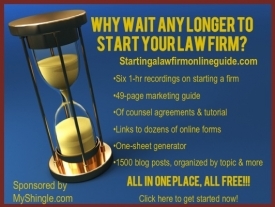 UPDATE – Two more ideas for busy lawyers who want to blog. First, group blogs. If you don’t have time to write more than one or two posts a month, you could band together with a few other lawyer/bloggers whom you trust. You’d each have a byline for your own post, but your clients would get the benefit fo a steady stream of content, plus any discourse between the participating bloggers. Second, dictation. Dictate posts on a drive to court and have an assistant transcribe them. Again, perhaps this won’t produce the most substantive post, but at least it’s your work. *An advertising disclaimer is appropriate because there’s a specific call to action associated with the disclaimer that I proposed. For blogs that provide pure educational content without a specific call to action, it’s my opinion that an advertising disclaimer isn’t necessary (in my view, general contact information or a link to your blog on your about page, is not, a “call to action” that would convert an otherwise educational blog into advertising). Of course, check your bar’s rules on this one!! !